As many of you will be aware Sr. Maureen has been poorly in recent months and has been spending some time with her Community recuperating. Its with sadness that we learn that her time and ministry in Carlisle will be coming to an end. We express our gratitude for her prayerful presence, her witness and her commitment to the spread of the Gospel during her time in Carlisle, particularly in her ministry in the Hospice and Hospital - she has brought many people back to the Lord and to the consolation of the sacraments by her gentle presence and witness. Please keep her in your prayers. If you wish to contribute to a farewell gift for Sr Maureen, please place in an envelope marked ‘Sr. Maureen’. 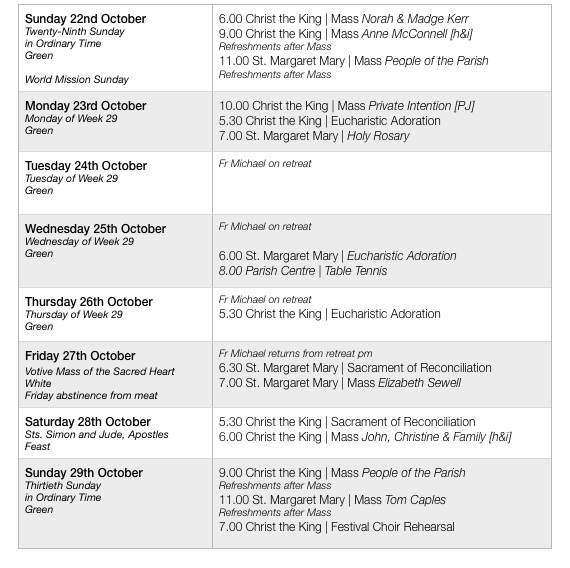 Today is (21st/22nd October) World Mission Sunday. This is your chance to support missionaries and the Church in proclaiming the Gospel of peace to those who suffer around the world, and now even in our own country and even in Carlisle! By supporting Missio, the Pope’s official charity for overseas mission, you will be sharing the peace and love of Christ with all people by helping everyone in need, regardless of background or belief. Today, your prayers and your devotion will help a spirit of peace spread across South Sudan and around the world. Please give what you can. Thank you - The Red Boxes. Numbers at Mass were Saturday evening - 74, Sunday 9.00 am - 70 and Sunday 11.00 am - 87, a total of 231. Thank you for the offering of £367 at Christ the King and £252.80 at St. Margaret Mary. The total being £619.80. 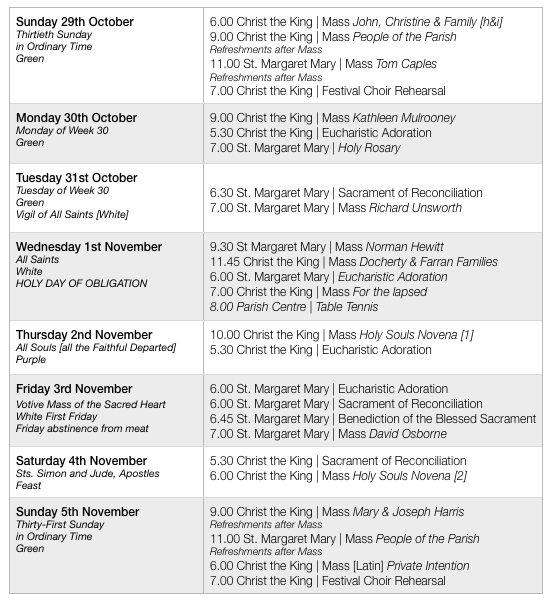 Wednesday 1st November is a Holy Day of obligate where we are obliged to attend Holy Mass. 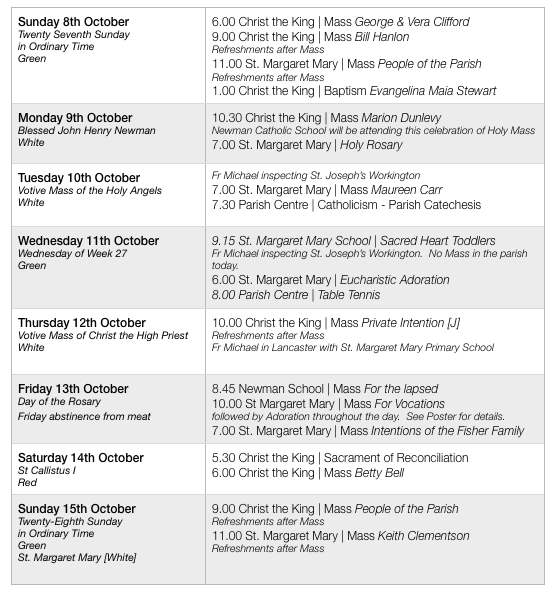 There will be a number of opportunities to attend Holy Mass that day - please make a note in your diary so that you can’t say ‘I forgot’. The Festival Choir will be meeting on Sunday evenings at Christ The King Church from 7.00 pm to 9.00 pm beginning on Sunday 29th October. Please consider coming along to help us to prepare for the Holy Season. Everyone is welcome. Fr Michael will be making his annual retreat during the half-term break. He is away from the evening of Monday 23rd October until the evening of Friday 27th October. Each year since 1954 members of parishes in Carlisle and district have joined together and gone on pilgrimage to the National shrine of Our Lady of Walsingham, in Norfolk. Cost: £220 for a standard room, including accommodation and all but one meal, an afternoon trip, entry to the site of the Holy House, tips and coach travel. If you would like to know more about joining the pilgrimage from Tuesday 3 – Friday 6 April, please contact Jo Muter: 524087 or jemuter47@gmail.com. 8-10 December - Take time out from the busy run-up to Christmas to prepare for the Lord’s coming. This weekend retreat, for young people in year 9 and above, will be a fun occasion to meet other young people and, together, reflect on what Christmas is really about through games, workshops, discussions and prayer. Cost - £65. To book: www.castleriggmanor.co.uk and for more information about these and other events. 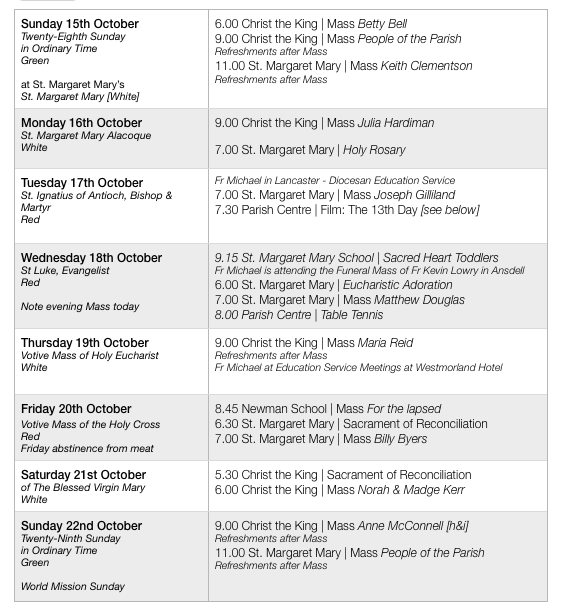 The feast of St. Margaret Mary will be observed during Mass this Sunday, 15th October, in St. Margaret Mary’s Church followed by refreshments after Mass. It is with sadness that we announce the death of Fr Kevin Lowry. Fr Kevin’s funeral Mass will be celebrated at St. Joseph’s Ansdell on Wednesday, 18th October, at 11.30 am. There will be a Mass for his intention at St. Augustine’s on Friday, 20th October, at 7.00 pm. Fr Kevin was a former pupil of St. Margaret Mary School. May he rest in peace. To raise funds for the new chapel at Newman School, St Margaret Mary’s parish centre, Scalegate Road will be holding a sportsman’s dinner to include pie & pea supper, raffle and auction. Comedian & MC: Howard Nicholson/After Dinner Speaker: Steve Kindon. This event will take place on Friday, 10 November, from 7.00 pm - 12.30 am. Tickets £25, from Paul Radcliffe - tel: 07813 327305 or from St Margaret Mary’s parish centre - tel: 524595. Numbers at Mass were Saturday evening - 52, Sunday 9.00 am - 57 and Sunday 11.00 am - 96. A total of 205. Thank you for the offering of £387 at Christ the King and £219.83 at St. Margaret Mary. The total being £606.83. This is postponed - a date will be arranged in the future. 7.00 pm to 9.00 pm commencing Sunday, 29th October. Please consider coming along to help us to prepare for the Holy Season. Everyone is welcome. Fr Michael will be making his annual retreat during the half-term break. He’ll be away from the evening of Monday 23rd October until the evening of Friday 27th October. Each year since 1954 members of parishes in Carlisle and district have joined together and gone on pilgrimage to the National shrine of Our Lady of Walsingham, in Norfolk. Cost: £220 for a standard room, including all but one meal, an afternoon trip, entry to the site of the Holy House, tips and coach travel. If you would like to know more about joining the pilgrimage from Tuesday 3 – Friday 6 April, please contact Jo Muter: 524087 or jemuter47@gmail.com.